When students make the campus their home, they'll make the most of their college experience. Take advantage of great programs to help them do and be their best at UNLV. Live independently in a supportive environment. Get involved in campus organizations and events. Spend more time doing the things they want and need to, like studying and spending time with friends, instead of commuting through Las Vegas traffic. Share the university experience with other students from different cultures. Participate in fun activities just for campus residents. Never have to worry about grocery shopping, cooking, or doing the dishes. Choose a living environment that meets their needs. Eat great food at just about any time of day at multiple campus locations. Housing and Residential Life facilitates a comfortable residential community through which accommodations, activities, and experiences encourage students to progress toward becoming self-directed individuals. UNLV is proud to offer on-campus housing for our students. It is cost effective and lets you live on a floor with students of similar interests, be close to campus resources, and learn in a safe and supportive environment. Live in the heart of campus in our traditional residential experience in UNLV owned and operated residence halls. UNLV offers on-campus housing for traditional first-year students, all students seeking a traditional campus experience, and for students who meet the criteria for the First Year Housing Requirement. Enjoy the perks and convenience of living on the UNLV campus as you reside at U-District, an official university-affiliated housing partner. 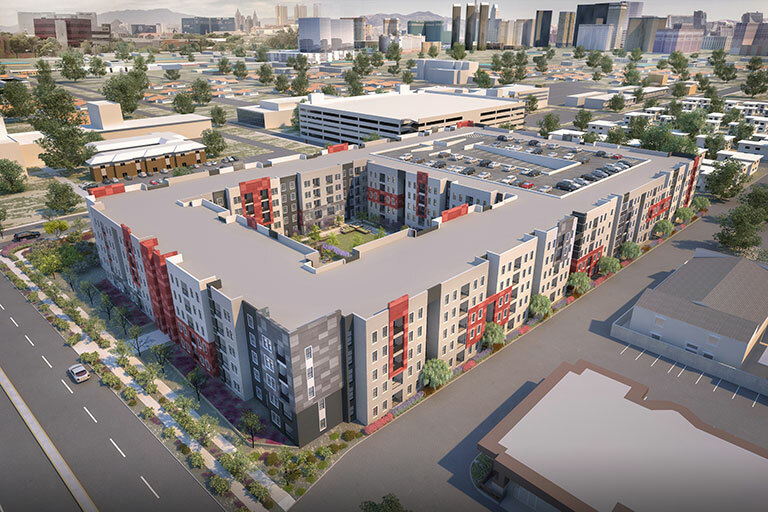 U-District is UNLV's brand new student community tailored for UNLV upperclassmen. U-District consist of two communities; The Legacy and The Degree. The Legacy offers affordable and spacious apartments, and The Degree offers brand new high end apartments and finishes. U-District has a wide array of floor plans and pricing to fit any budget and need. Be a part of something greater and experience the U-District lifestyle! "UNLV Housing & Residential Life has made my experience on campus both exciting and fulfilling. I have never been a part of such an enthusiastic and supportive community."